Way back in October I introduced Project Blackford, my super secret foray into the shared universe of some well known, well respected, and award winning authors. Much to my astonishment, I found I wanted to keep most of the information to myself. My self esteem is just a bit more fragile than I realized. I didn’t want to announce what I was doing for fear of failure, I mean, what if they didn’t like it? What if I made a big deal about writing a story for them and it just didn’t make the final cut? Why don’t I stop whining and build some excitement instead? 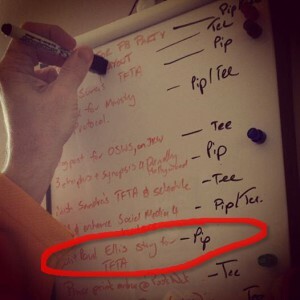 I’m being disingenuous, I don’t think I was ever going to tell, except Tee recently posted the above image on Facebook, extolling the virtues of whiteboards. As you can see, I haven’t Lepetomane‘d it yet. I am incredibly excited by the opportunity and having a bit of a fanboy moment. I am also scared to death. Last year, I asked Pip & Tee if they would be open to a short story pitch. I can’t claim to know them personally, I’ve only met them at book signings and conferences. We don’t hang out together, or ask each other for advice. They are authors; I’m a fan. But I figured it couldn’t hurt to ask. At worst, they would tell me no. That’s what I told myself. Little did I know what would happen when they said yes! I froze. Then, I dawdled for a while. I had sent samples of my writing (at their request), so they evidently saw something, but I was having a protracted and unaccustomed bout with self-doubt. I had the courage to ask, but having fallen victim to talking a big game, I was balking on delivering. It took me awhile, but I finally got over myself and wrote. And wrote, and wrote, and wrote! Over three and a half times what they ask for! Which turned out to be three and a half times more than they could use. Pip and Tee are gracious. Instead of just telling me ‘No,’ they asked if it could cut it down to something manageable. I said yes, winced, then got out the ax. My story was way too big. The worst part: I knew it. Pip and Tee had told me, rather specifically, what they were looking for length-wise, and I allowed the story to get away from me. And, run clear across state. I was in a quandary of my own making. So began the laborious process of unwinding parallel plot lines and characters, in an effort to fit into the story requirements. After a week of cutting and pruning, including dumping one entire plot line I believed pivotal (it was key in the pitch) and excising one scene where a character’s spouse dies, revealing that character’s central motivation, I stitched my tale back together. It was a little longer than requested, however it was accepted for edits. What does this mean? In the short term, I wait and see what, if anything, survives said edits. This is one of the expectations I have steeled myself for. I have found working collaboratively in a shared world presents a set of unique challenges and truths. It may be ‘my’ story, but it’s not ‘my story.’ My tale is set in their world, one I wrangled an invite into. No matter how groovy I think this story is, ultimately it’s their call. I can take as many chances as I want, provided I realize they may not want those chances taken. It’s their characters and their intellectual property. I have a day pass, and need to respect that. Pip and Tee may have no objection to my story at all, but they may not feel that it is canon. I have incorporated some pretty cool plot twists. I think they will like them, but they may not want to take the franchise down that road. They have a profitable series of books and may not care to allow me to monkey with that. Some characters are unkillable, and some plot devices are unusable. That’s a given, this universe is shared between many authors. In the end, I just may not be a good fit. So now, I write other stuff while I wait. I’m not going to lie, it would be incredibly cool to have my story accepted, and a great deal of fun to voice the accompanying podcast, but the reality is, I’m the newb here. Well, following the link and browsing down the interminably-long page, I finally found mention of a story by you in one volume. You finally made it; why didn’t you update your legions of adoring and/or sparkly fans that it’d been a successful run for participation in a Shared World?